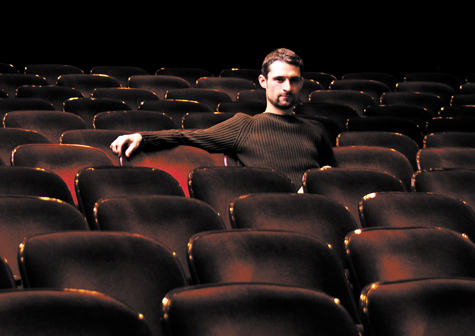 Matthew Ivan Bennett’s first play was about unrequited love. He wrote it at 14. While most old wannabe Werthers set their larval romance stories in the cafeteria where tragedy struck, Bennett’s play took place 10 years later, in Mexico. Indulgences remained––the girl tells the boy how wrong she was to have broken up with him––but already Bennett showed an eye for a hopeful future rather than a bleak present. Bennett is currently the resident playwright at Plan-B Theatre Company, again deviating from the instincts of his peers. Aspiring artists usually flee Utah, citing it as a cultural wasteland. But Bennett chose to eschew the throng of obese midwestern ballet dancers and loudmouthed Kerouac disciples overcrowding the big cities. After graduating from Southern Utah University, Bennett returned to Salt Lake and began writing for Plan B, dedicated to making Utah a better place for the arts. Whatever he’s doing, it’s working––Plan B’s season has sold out. SLUG: How has your experience been working with Plan-B? Matthew Ivan Bennett: I haven’t had any restrictions, and that has been beautiful. In Cedar City, we were constantly fighting with professors and administration over the content in our shows. SLUG: Your work focuses heavily on enlightenment. Do your feel like your own personal “eurekas” inform your writing? MIB: Certainly they appear when I’m writing. On some level, a writer, if they aren’t doing it for a job or a commission, writes a script or a novel because they have questions, because they’re bugged about something. Certainly, there are plays that just provide answers, but I’ve always preferred questioning those answers. SLUG: Does working in dialogue allow you to more freely debate with yourself? MIB: Exactly. One of my professors said that writing is the art of talking to yourself without going crazy. I’ve found that to be true. Sometimes I do go crazy, but I always come out on the other side. SLUG: Block – 8 just finished its run. Why write the story of a 1940s Japanese internment camp for audiences in 2009? MIB: If nothing else, I wanted there to be empathy around the issue. In approaching the writing of it, I realized that we don’t really learn by formal debate. I think it has its place, but I think the only way anybody ever changes their mind – especially about something they did, or something embarrassing their country has done – is by trying to put themselves in the shoes of another, through an experience. People rarely change through thinking things out rationally. In writing Block 8, I realized that the best way to approach the subject was through an emotional exploration of the camps. I wanted to take people inside that experience. SLUG: Your newest play is about Leonardo da Vinci. What do we have to learn from him after 500 years? MIB: At first all I could really see was the mythic image of Leonardo. But gradually as I researched more, I saw him as human. He doubted himself, as multi-talented as he was. He wrote, “As a kingdom divided against itself is weakened, so is the mind by different studies.” That struck me. SLUG: There are critics who would argue that live theatre is dead, citing that live is an age of a more instantaneous habit of entertainment. What keeps theatre relevant and vibrant? MIB: The idea that theatre is out entirely is dead wrong. I think that in the next 20 years, it will be reborn in different mediums. As technologies such as virtual reality come into being, we’ll see theatre be reinvented via the Internet and via interactive immersive mediums. I think they will complement each other. And we have a young audience. SLUG: Why work in Salt Lake, as opposed to New York, or another more traditional theatre hub? MIB: I’m not a big-city person. I tried Chicago for a while, but I missed the mountains and the desert. But also, I think there’s a very vibrant counter-culture here. It’s been very wobbly for a couple of years, especially with a lot of venues being shut down. But I still think it’s on the rise. There’s no question that alternative theatre choices have grown since I was a kid. I’d like to help it grow further. I’m here because I want Salt Lake to have great, vibrant theatre. MIB: There’s not really a defined path for becoming a professional playwright, but at the stage where I am, many writers are pursuing fellowships or working at universities. I’m not going those routes, so I think earning a living, as a writer, may take longer. But I’m patient. And I’m happy to work here. There’s nothing with the final destination of my work being Salt Lake. Bennett’s latest play Di Esperienza runs from April 3-19 at the Rose Wagner Theatre.